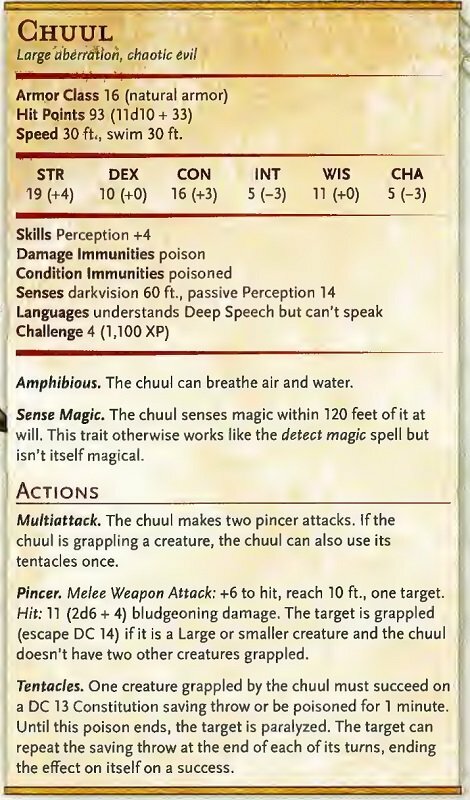 Chuul are one of the more modern monsters in D&D history. They didn’t appear until the year 2000, which was the first official year of the future. Originating in 3rd edition, these yellow lobster monsters have clawed out a niche for themselves as some of the best monstrous minions you can find, proving to be a threat that’s fun to fight whether you’re low-, mid-, or high-level. Let’s take a look at the rule of Chuul. 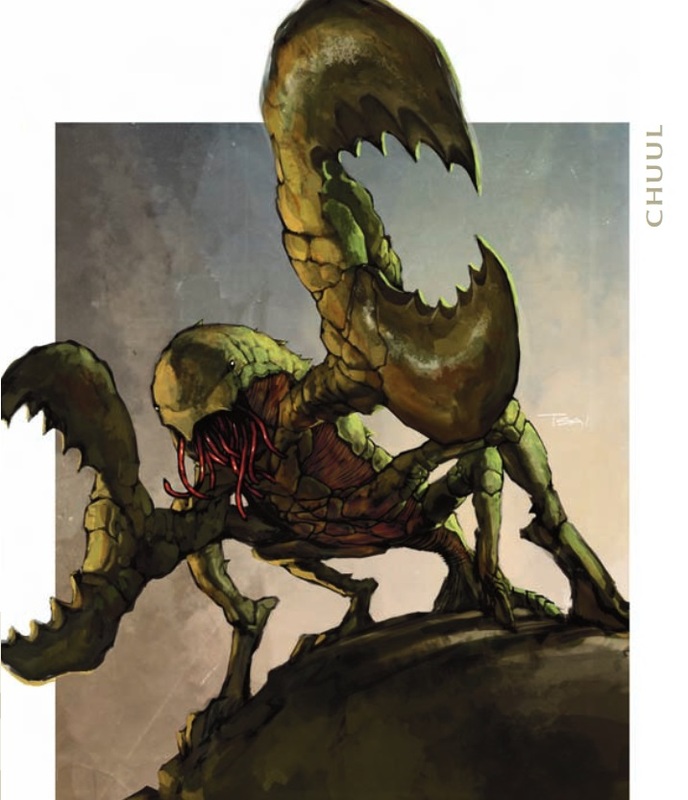 When Chuul first appeared in the 3rd Edition Monster Manual, they struck a chord with many gamers. 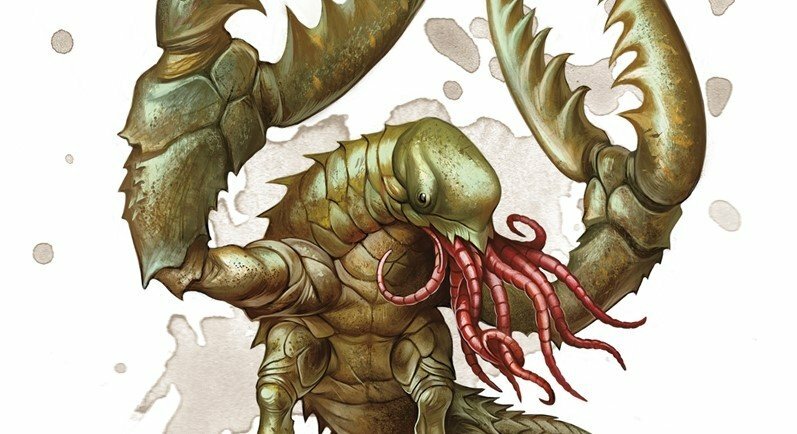 They were a fantastic enemy–mixing the terror of the unknown that the sea still kind of holds for us (looking at you, Lovecraft and friends), with some of the truly alien and monstrous creatures that D&D is all about. And as “a horrible mix of crustacean, insect, and serpent,” these aberrations are specifically made up of the creepiest, crawliest things. As an aberration, they’re given some of the most monstrous stuff out there. 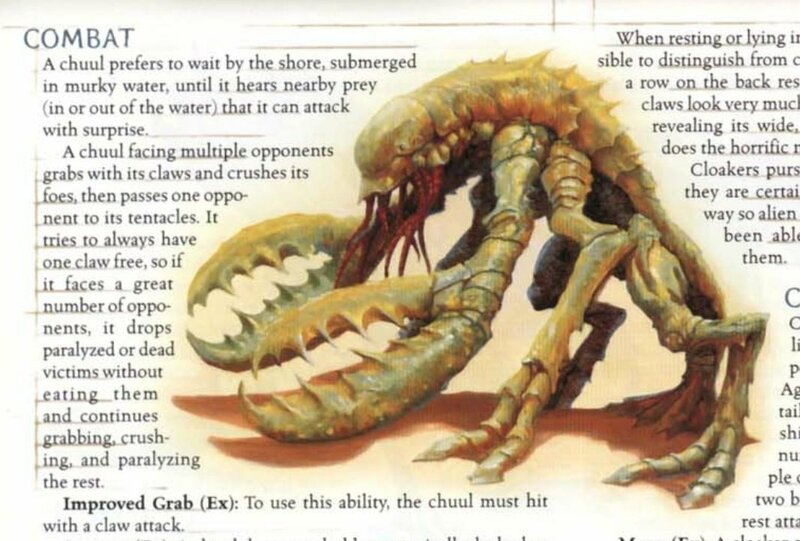 Powerful combatants in their own right, 3rd Edition Chuuls benefitted from being large and in charge, using their claws to grab and crush their opponents, paralyzing them with their tentacles, and actively devouring opponents while they fight. They’re also a perfect minion for Aboleths, Beholders, Mind Flayers, or any other higher-tier aberration. It just works. In Dragon #330, which was all about the Far Realm and other aberrant monsters, the Chuul got an expanded ecology, including a look at their lairs and habits. And they’re terrifying. In 3rd Edition, these monsters knew how to hit you where you live–they’re described as attacking caravans and beasts of burdens, driving the guards and merchants they will eventually prey on to madness and exhaustion before finally descending on them and feasting. 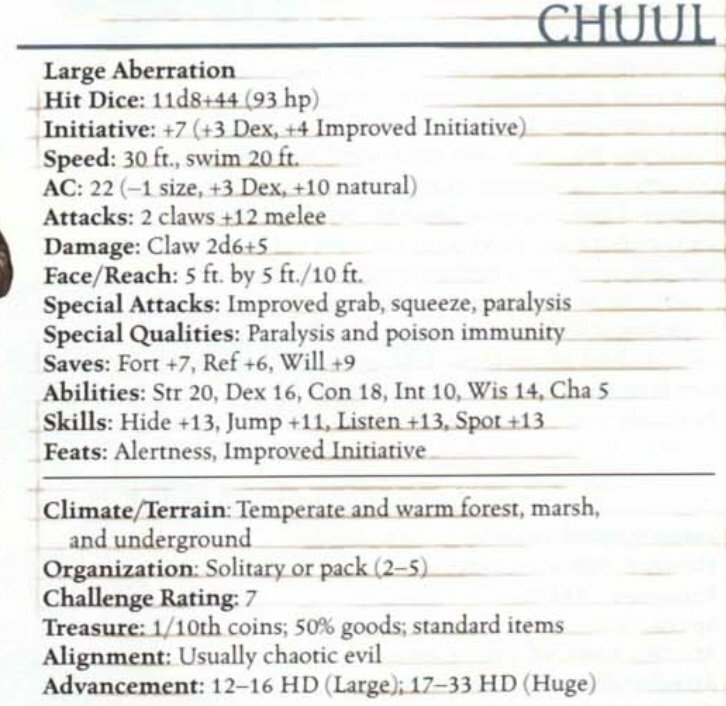 4th Edition D&D realized what a great brawler the Chuul were, and made extensive use of them. 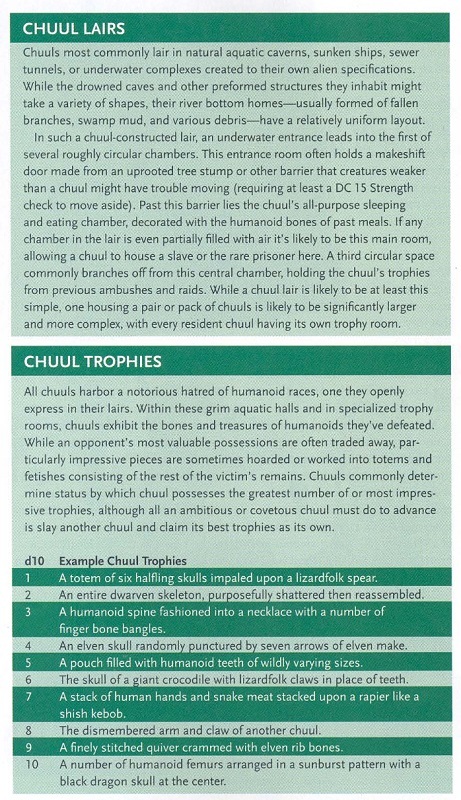 In the 4th Edition Monster Manual we get two different variety of Chuul–standard and Juggernaut. Both versions are pretty frightning, with a higher-than-normal AC and hit point total, they were resilient monsters that could crush and immobilize opponents. The Juggernaut in particular had some terrifying abilities, combining the physical brutality of the Chuul with a Psychic Lure that would damage creatures and pull them right into its claws and tentacles. For whatever reason, in 4th Edition, they ate everything but the brains of humanoids, which made them best friends with Mind Flayers. 5th Edition Chuul are where it’s at. In the current edition, these are survivors of an ancient aboleth empire, long crumbled into the wastes. 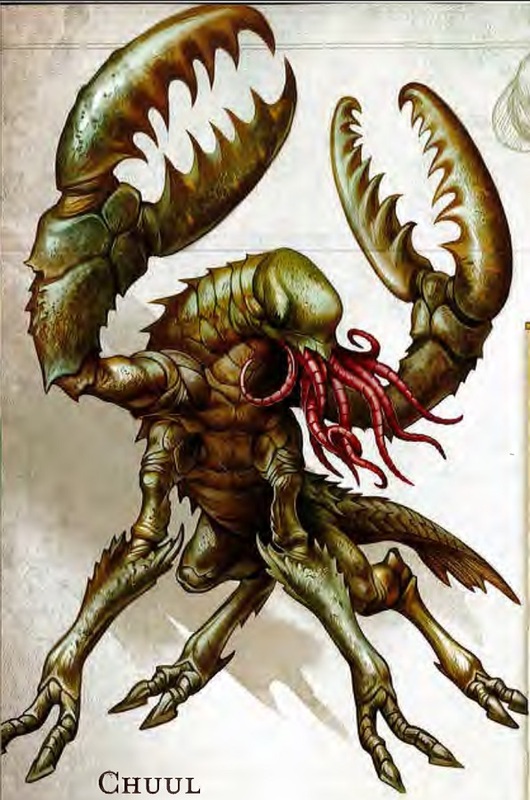 These crustacean servants were uplifted by these primeval aboleths, and used to collect sentient creatures and especially magic for the murky masters, and designed to endure above all else. They don’t make them like they used to, apparently, because the Chuul are one of the few things to survive those primeval, forgotten days. Chuul have their own, primitive instincts and motivations now–but you get the sense that they’re always just waiting for their masters to return. And in fact, when they do, they fall back into place as though they’d never left. They’re also just a great monster to bust out against a party of any level. They’re absolutely terrifying against a low level party, but have powerful enough attacks to threaten lightly armored foes well into the upper levels of the game. They’re large and have a 10-foot reach, which means if you pincer someone, you can hold them at bay, preventing them from attacking you back. You can drag someone closer to paralyze them, then claw them with advantage. But the Chuul’s best tactic is grappling two creatures and forcing them to use their action to try and accomplish anything. That and sticking to the darkness and water, where their swim speeds give them a significant advantage. As we saw with the Merrow, the Chuul are also well-equipped to emerge on land, grapple foes, and drag them back to the water where their prey will drown. Always good fun. If you’re looking for some brutal monsters that have an unsettling, primeval feeling, you can’t go wrong with Chuul.